During the early to mid-1970s the State of Montana Air Quality and Water Quality Programs began conducting investigations of smelter emissions and surface water discharges at the ASARCO East Helena smelter. Early results of air quality and soil metals analysis confirmed the long-held suspicion that arsenic, lead, cadmium and other contaminants were accumulating in the soil and water, and were also present at high concentrations in street and household dust throughout the community of East Helena. Smelting operations deposited lead, arsenic, copper, zinc, cadmium, and some 15 other hazardous substances into the surrounding area. This contamination impacted human health, air, soil, surface water, groundwater, vegetation, livestock, and wildlife. In September 1984, the U.S. Environmental Protection Agency (EPA) listed the East Helena Site on the National Priorities List (NPL) pursuant to Section 105 of the Comprehensive Environmental Response, Compensation, and Liability Act (CERCLA). From 1984 through 1997, the limited investigations and remedial actions conducted at the Site by ASARCO consisted of either voluntary actions or actions implemented as part of settlement agreements between EPA and ASARCO under CERCLA. Lower Lake: Two, 1,000,000-gallon process water handling and storage tanks were constructed and put into operation to replace the need for Lower Lake settling process water. Several thousand cubic yards of contaminated sediments were dredged from Lower Lake, dewatered, and stored on-site awaiting disposal. Dried sediments that were not recycled were later placed in a Corrective Action Management Unit (CAMU I) under RCRA. ASARCO built a High Density Sludge (HDS) water treatment plant in 1994 and a stormwater runoff collection tank in 1997. In 2002 the remaining sediments were placed in CAMU I.
Speiss Granulating Pond and Pit: Soil was excavated to the maximum depth practicable without compromising the integrity of adjacent structures. The Speiss granulating process was changed from a water-spray to an air-spray process to eliminate continued downward percolation of process water into underlying ground water. Former Thornock Lake: Sediments were excavated and recycled on-site. Acid Plant Water Treatment Facility: Excavation and replacement work was done to reduce or eliminate leakage, seepage and percolation of acid plant wastewater into the ground. New treatment facilities were constructed and acid plant sediment handling procedures were upgraded to minimize direct contact between the saturated sediments and the ground surface or groundwater. In July 1991, ASARCO began a non-time-critical removal action of contaminated soil from residential areas, parks, playgrounds, streets, and alleys in the community of East Helena. ASARCO conducted much of the cleanup from 1991 to 1996 but it is still ongoing. The ROD for the residential soil operable unit was only issued in 2006. In January 1998, ASARCO and EPA agreed to a multi-million dollar settlement for violations of RCRA and the Clean Water Act that included illegal burning of hazardous waste. 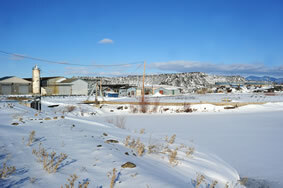 The settlement specified a Supplemental Environmental Program and an Environmental Management System for the smelter operation. It was decided that RCRA would be the governing authority for corrective actions related to the former plant site and groundwater. Superfund would continue to be the governing authority for cleanup of residential and agricultural soil in the community, as well as any surface water source that may require cleanup.